To be blunt – Happy Hour was a dud. When the rain came at 4:15, a lot of the teams packed up and called it a day. The rain didn’t last long at all, and soon cars were back on track. There were a handful of the front-runners trying to find a little more speed. But most on track were those whose aim is to stay off of the bubble tomorrow. No times at the top of the chart changed in the last few hours. 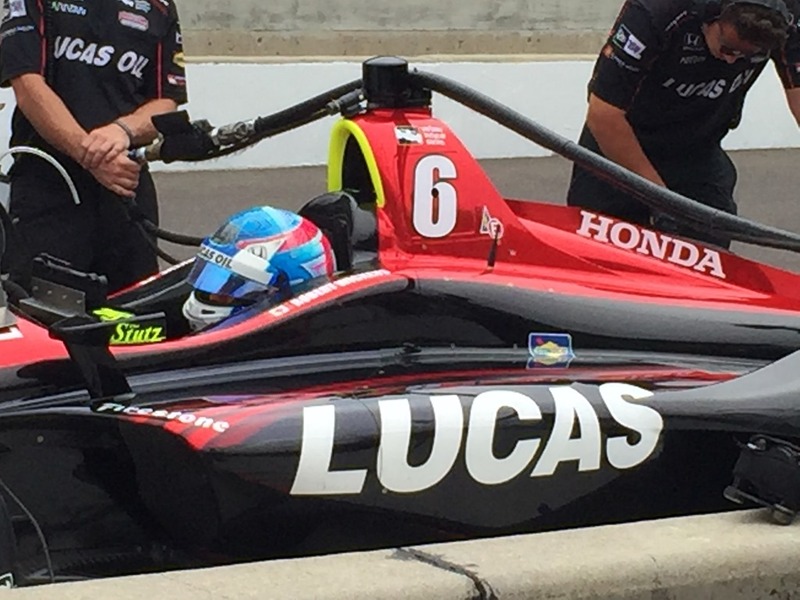 Robert Wickens was second quick behind Marco Andretti, but his team kept him out there until the bitter end. 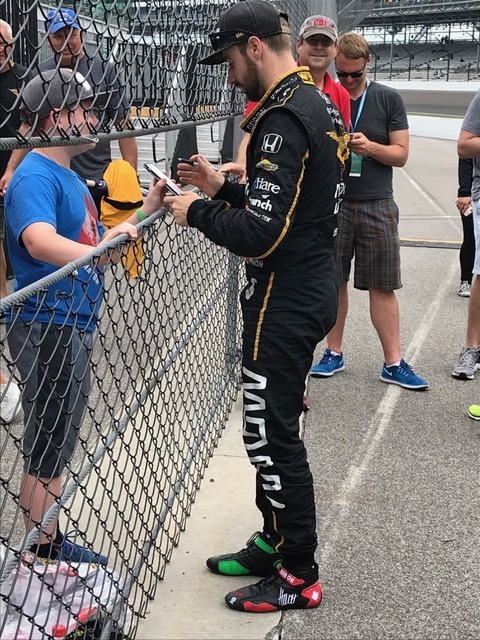 His teammate, James Hinchcliffe, had a little more time on his hands. He spent a ton of time in the pits signing autographs for fans. 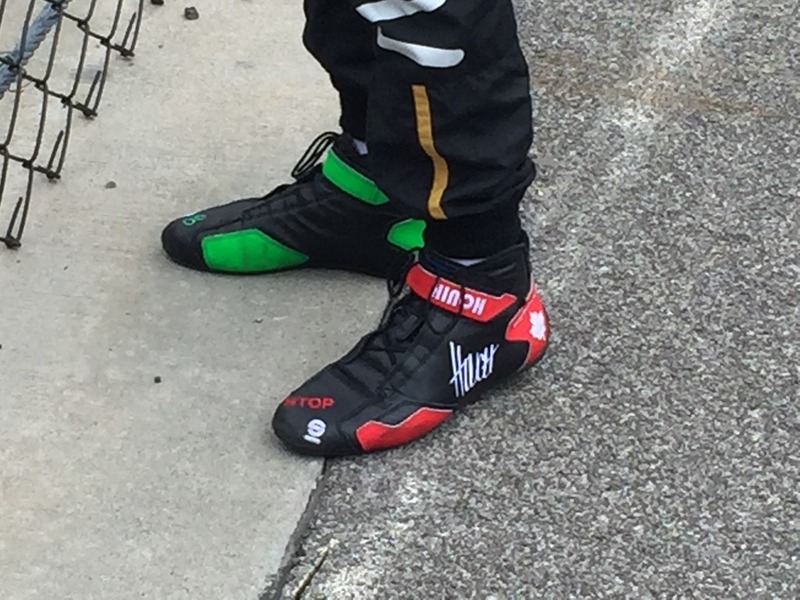 I also got a good photo of his shoes, which are red and green – the right foot is the GO foot on the accelerator and the red shoe is on the STOP foot for the brake. Get it? That’s going to do it for today. It was a good day at the track, but usually Happy Hour on Fast Friday offers non-stop action. Happy Hour today just sat there. But I was at the Indianapolis Motor Speedway today. That made it a good day. If I didn’t mention it, today is our sixth wedding anniversary. It was also on Fast Friday six years ago today that we got married right here. We took our small wedding party to Dawson’s for dinner afterward. Therefore, we will go to Dawson’s tonight. It’s my favorite place here. We will try to get here early in the morning. Please check back early tomorrow. Hopefully, the weather will cooperate like it did today. This entry was posted on May 18, 2018 at 5:47 pm and is filed under Indianapolis 500. You can follow any responses to this entry through the RSS 2.0 feed. You can leave a response, or trackback from your own site. Congratulations! Great place for nuptials! Let’s be honest, George, Fast Friday itself was a dud. I was there from 9am and was waiting for nonstop track activity and it was a calm day like a Wednesday, lol. Did you happen to miss the Vice President of the United States’s visit to the Pits and Gasoline Alley? It was the excitement of the day!